Our members make our work possible. As a member, you join a network of more than 15,000 members and supporters who are committed to protecting our shared architectural and cultural heritage. Members receive regular updates from CPF about our work, and receive significant discounts or complimentary registrations to our programs (discounts vary depending on membership level). One member rate ticket to all CPF events. This membership is free for students. Two member rate tickets to all CPF events. Two member rate tickets to all CPF events and the ability to designate a portion of your contribution to the fund of your choice. Ideal for sole proprietors, small nonprofits, and government agencies (5-10 people). 25% off all workshop registrations. Member rate at all other CPF events and optional listing in the Online Professionals Directory. Ideal for individuals invested in preservation and medium sized firms, nonprofits, and government agencies (10-20 people). One complimentary registration to the California Preservation Conference and President’s Circle Reception. Significant discount to the California Preservation Awards. Complimentary registration to live and recorded webinars. 50% off all workshop registrations. Ideal for individuals committed to preservation and large firms, nonprofits, and government agencies (more than 20 people). Two complimentary registrations to the California Preservation Conference and President’s Circle Reception. One complimentary registration to the California Preservation Awards, and a significant discount for additional tickets. Interested in receiving additional benefits and visibility? Check out our sponsorship options here. Click here for a downloadable matrix of membership and sponsorship benefits. 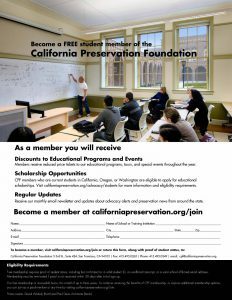 Students enrolled in college, university, trade schools, or full-time professional training programs are eligible to receive a free membership to the California Preservation Foundation. This membership provides all the same benefits as our standard membership, including event discounts, regular updates from CPF, and invitations to exclusive members-only events throughout the state. This free membership is renewable twice, for a total of up to three years. To continue receiving the benefits of CPF membership, or explore additional membership options, you can join as a paid member at any time. 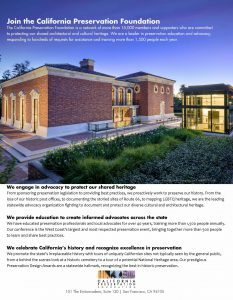 In 2018, the California Preservation Foundation announced a brand new membership menu that made it easier than ever to support our work and gain access to our educational programs. Read more about these updates below. Over the last forty years we have added multiple membership levels to meet the needs of our members, leaving us with an often confusing array of membership options. Starting today, we have consolidated our previous 15 levels into just 6 – ranging from $50 to $1,000. Starting today, all members at $250 and above receive completely free access to all of our webinars, and a steep discount to our live workshops. Members at $500 and above also receive our recorded webinars for free, giving you access to over 200 high quality recordings you can use to learn and train your staff. Previously, using your membership benefits often required calling or emailing us to request access to a particular program. While we love hearing from you, we also understand that this added another step to the process, making it more difficult and confusing to access our programs. Starting today, all member discounts are automatically applied if you are logged in. So, if you are a $500 member and want to register for an upcoming webinar, just log in and the event registration will automatically go down to $0. If you want to sign up for a workshop, the price will automatically be cut in half – and you can use this discount for as many people in your organization as you would like. No more unnecessary barriers. These updates were designed to make it easier for you to access the high quality programming you have come to expect from CPF. We hope you find them helpful, and welcome your feedback. If you have any questions, concerns, or just want to chat, you can reach Andrew Shaffer a call at 415.495.0349x 202 or andrew@californiapreservation.org.